Kadir López graduated from the Provincial School of Arts in Las Tunas (1986), the Professional School of Arts in Camagüey (1990) and the Superior Institute of Art in Havana (1995). Since the ‘90’s, his work has been exhibited in more than one hundred solo and group shows worldwide. In addition, he has participated in several prominent international events and art fairs, including the Havana Biennial, the Toronto International Art Fair (TIAF), ArtMadrid, the Miami International Art Fair, and Art Palm Beach. He received the Prize of the Contemporary Cuban Art Salon, organized by the National Museum of Fine Arts in Havana in 1995. Other awards include the First Prize of the Provincial Salon (Las Tunas Art Center, Las Tunas, 1992 and 1989), and the First Prize of the Guernica Salon (Las Tunas Art Center, Las Tunas, 1991). López has lectured at conferences at universities and museums worldwide, and has served as a juror in numerous national art contests in Cuba. 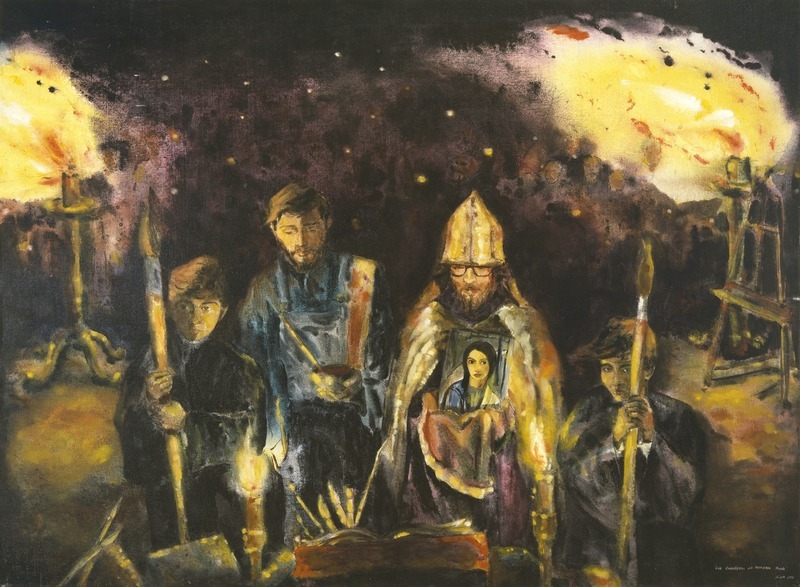 His work can be found in several major museums collections, including the National Museum of Fine Arts in Havana; the Arizona State University Art Museum in Phoenix, Arizona; the Museum of Latin American Art (MOLAA) in Long Beach, California; the Museum of Finest Cuban Arts in Vienna, Austria, as well as in many private collections internationally. Todo (Everything), 1990. Acrylic on canvas. 53 x 65 1/2 in. Memoria 1926 (Memory 1926), 2001. Oil on canvas. 35 1/4 x 46 3/4 in. Los caballeros la prefieren rubia (Gentlemen Prefer Her Blonde), 1990. Oil on canvas. 35 1/4 x 47 1/8 in. Shell, 2008. Mixed media on porcelain-laquered steel. 46 x 46 in. Gulliver Punch, 1997. Watercolor on paper. 11 x 14 in. Gallo (Rooster), 1998. Fiberglass and resins. 21 x 12 x 8 in.